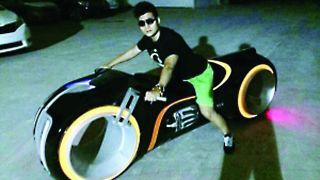 Imagine it: you spend around $55,000 on the world's coolest Tron Light Cycle replica only for your home country to tell you're not allowed to ride it. But look at his face. He doesn't care. He owns a Tron Light Cycle and he's going to sit on it and look cool until it's legal to drive and that's totally fine by him. China's People's Daily says Mr Lu's bike, which wasn't built by a registered manufacturer (hence being banned) can hit speeds of up to 120 mph. Naturally, it's battery powered too. Lu, while you're waiting for China to change its mind, this TechRadar writer owns a Tron-inspired watch (this very one) that would really complete the look. Happy to take that bike off your hands for a while.